A HUMAN PERSPECTIVE Russians have faced many hardships since the breakup of the Soviet Union. But few have been as difficult to overcome as the collapse of the Soviet command economy. After the Soviet Union collapsed in 1991, the region’s people began to participate in a capitalist system. One Russian bitterly summed up the sudden transition in this way: “You developed your capitalist markets in the West over hundreds of years, and our government wants our people to go to sleep one night in a Communist world and wake up the next morning in a capitalist one.” One of the toughest problems facing Russia’s leaders is how to carry out economic reforms without causing too much turmoil for the nation’s citizens. After the Soviet collapse, Russia tried to move quickly toward a capitalist system. This meant ending the tight control that the central government held over economic activity. In January 1992, Russia removed the price controls that had been set by the Soviet government on goods sold within the country. The effect was dramatic. Almost immediately, the prices of many goods increased by 250 percent. In the same year, Russia began to sell government-owned businesses to individuals and private companies. This process was called privatization. But few Russians had enough money to buy large businesses. So, leaders offered vouchers to the public. The vouchers were like loans that could be used to purchase businesses. The purchasers promised to repay the government with future profits. But the policy had mixed success. Many of the new businesses were not profitable, and their owners were unable to repay their vouchers. The failures contributed to an economic crash in Russia in 1998. In spite of this shaky start, though, over 60 percent of the country’s workforce worked in the private sector by the end of the 20th century. Since the 1998 crash, Russia’s economy has moved slowly toward recovery. But the movement toward a market economy has yet to benefit most Russians. By the end of the 1990s, nearly 40 percent of the Russian population lived far below the poverty line. Some people even wondered whether things had been better under the Soviet Union. Russians have made slow, if painful, strides toward capitalism. Even so, many obstacles remain. Russia’s enormous size and the rise of organized crime are among the most important. A major obstacle facing economic reformers is distance decay. This means that long distances between places make communication and transportation difficult. 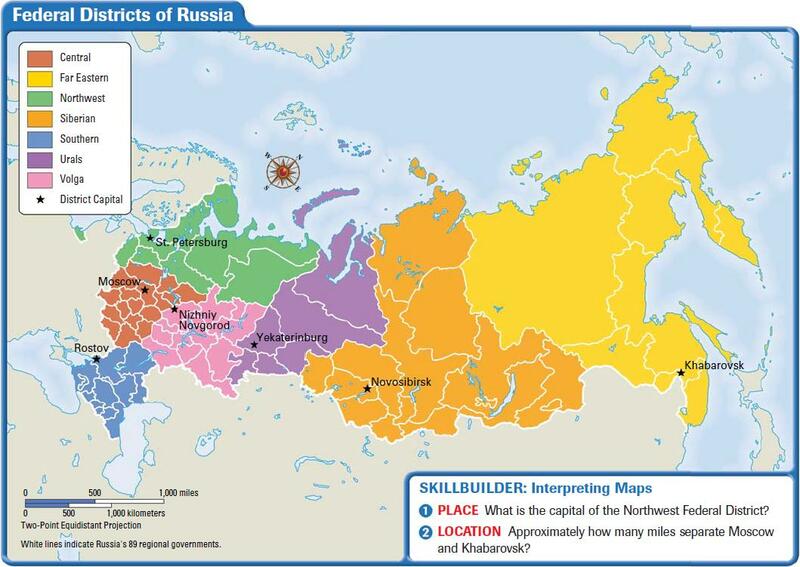 Russia is an enormous nation, stretching across 11 time zones. Spread over this vast area are 89 different regional governments. The interaction and cooperation of these regional leaders with Moscow is crucial if the government’s economic reforms are to be successful. But because the central government in Moscow has been weak, officials far from the capital sometimes refuse to carry out the government’s reform programs. In the spring of 2000, Russian President Vladimir Putin created seven large federal districts to gain more control over regional leaders. Each has its own governor-general. Putin hopes that the heads of the new federal districts will force regional officials to carry out the economic reforms that Moscow wants. As the government tries to improve the economy, it must also face a powerful enemy—organized crime. The “Russian mafia,” as criminal organizations in the republic are sometimes labeled, grew rapidly during the 1990s. By the end of the decade, the mafia had created its own economy. In 1998, the government estimated that organized criminals controlled 40 percent of private companies and 60 percent of state-owned enterprises. Russian criminal activity also expanded outside of Russia. The mafia even tried to sell a Russian submarine to drug barons in Colombia. The growth of organized crime has slowed economic reform by rewarding illegal activity over honest business. And because illegal activities often go undetected, the government cannot collect taxes on them. Russian officials have taken initiatives to combat organized crime, including the addition of more officers to a special tax police. In February 2001, Russia’s prime minister reported increases in tax and customs revenues. Government officials said the increases are a sign that the Russian economy is on track. If the growth in revenues continues, Russia will be better able to come to terms with the legacy of the Soviet Union and will be able to improve the living standards of its population. In addition to the economic problems inherited from the Soviet Union, this legacy includes the problems created by Soviet nuclear programs, which you will read about in the next section.